Learn to set goals. Remember - everything in high school counts. Take challenging courses, and do well. Always ensure your grades reflect your work ethic and show what you're doing, rather than what you're not doing. Create your Naviance account and begin compiling your resume. Build your resume by pursuing extracurricular, athletic, volunteer, and leadership opportunities. Depth means more than breadth in these areas. Do something meaningful over the summer. Students take a weeklong college trip heightening their awareness of various types of colleges. Evaluate your academic interests, and set goals to stretch yourself. Work hard, and let your teachers know you care. Prepare for the PreACT in October. Make use of Test Prep in Naviance and with Kahn Academy. Take the personality test in Naviance. Take on leadership roles in extracurricular, athletic, and/or volunteer activities. Begin researching colleges and take advantage of the Spring College Trip. Review your academic and extracurricular plans. Students meet in small groups with the College Counselor during the spring to help them prepare for all aspects of the College Application process. Evaluate your academic performance. Take even more challenging classes, as appropriate. Take the PSAT and use your results as a baseline for improvement. 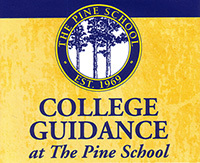 Meet with college representatives visiting The Pine School. Attend the "College Kickoff" meeting with your parents. Register and prepare for spring SAT, ACT, and SAT Subject Tests. Update your resume/activities in Naviance. Choose challenging senior courses in a variety of disciplines. Request recommendations from your teachers. Work steadily. The entire year counts! Be sure your testing plans are in place and registrations are timely. Choose a range of colleges to which to apply. Prepare all state applications early in the fall. Write several drafts of essays to review with faculty. Understand Early Decision and Early Action. Know (and adhere) to deadlines. Prepare financial aid and scholarship paperwork. Prepare for college admission interviews, if applicable. Follow up with colleges to make sure all application materials have been received. Reap the benefits of four years of good planning!